When Luke is confronted with Stellar, his superpowered twin from another dimension, he is highly suspicious. No one travels through time and space without a plan, and that plan is usually EVIL. So what does Stellar want? And why is he so UNBELIEVABLY IRRITATING? From his superhero hair to his rocket-powered shoes, Stellar is up to no good, and Luke must BRING HIM DOWN! Do you know your superheroes from your supervillains? How about Top Trumps from your Cosmic Jenga? David has covered it all in the latest installment of My Brother is a Superhero series. 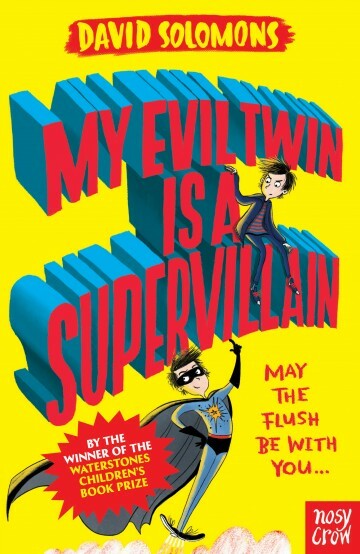 'My Evil Twin Is a Supervillain' is the third and thrilling installment. It is equally as brilliant and engaging as the previous two books in the series. The narrative glides across the open skies along a slipstream of subtle humour and comical adventure that will make you laugh out loud. David writes with a dark side that is filled with a screen-like purpose that will appeal to the inner core of every big kid, young or old. It is as if he has donned his cape and is playing top trumps with evil villains. Everybody will love this book; it's easy to read and especially great for reluctant readers. From the very first page, the parallel universes collide with explosive COSMIC capers, sibling rivalry, and Zack's mock exams. Will the universe need saving from Luke's evil twin, Stellar? The reader is heading for a galactic showdown like no other. This is a fantastic narrative full of action and crazy mayhem. It will sock you in the sci-fi world as you follow the young superheroes and/or villains trying to save the multi-universe from self-destruction. Nevermind Gorgon the World-Eater, but who does he think he is? David Solomons has been writing screenplays for many years. His first feature film was an adaptation of 'Five Children and It' (starring Kenneth Branagh and Eddie Izzard, with gala screenings at the Toronto and Tribeca Film Festivals). My Brother is a Superhero is his first novel for children. He was born in Glasgow and now lives in Dorset with his wife, the novelist Natasha Solomons, and their son, Luke.